How much is96 tons of gold worth? This lets us know that there IS NOT 40 trillion dinars in circulation.....as MANY are suggesting! This amount represents 3 different ways this hard currency is held, in the public market, the banks, and bank coffers. This info is really good for us....it would be interesting to know the percentages of all 3. Everyone is missing it IMO......don’t look at spreads of 1%-2%......the reason why there has been a major issue with their economy is the dependency on the US Dollar. The banks in Iraq were able to manipulate the currency market because of the discrepancy in the auction price, the price the Iraqi banks were selling the USD to their citizens, and the street value of th Iraqi Dinar. The monetary policies the CBI has established have worked and the auction price and the street value and now the SAME....hence the change with the CBI website to 1190 dinars/one dollar. NOW what does all this mean......the Iraqi banks and Currency exchange companies in Iraq NO longer have the ability to make a profit on selling the dollar!!!! That was their #1 way to make money......if you pay attention to all the articles the CBI has put out stating they want to banks to LEND.....Hello, that’s how REAL banks make money! Iraqi banks are NOW in the position to act like real banks. Once banking really occurs....LENDING to the public (all those house, car, and business loans they are NOW making) then The Iraqi Dinar will be able to gain in value! A healthy economy leads to a strong currency! 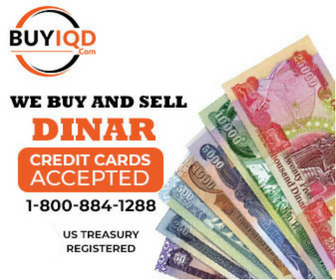 Most importantly the Iraqi people will want to use the Dinar once again with pride........GO DINAR!!!!!! Looking to sell 12 million Dinar @850/million. Im old school and prefer to deal face to face.....I live in Bakersfield, California and am willing to travel some what......Thanks in advance to anyone that responds.